This UNIVERSAL pattern that works in EVERY yarn! The piece is worked from the center out, divided into 8 equal sections with markers. This pattern is not sized in a traditional, standard way, but you determine the sizing based on two simple measurements; the cross-front measurement (from armhole seam to armhole seam in when wearing a fitted T-shirt, just above the breasts) and the fingertip to fingertip measurement. 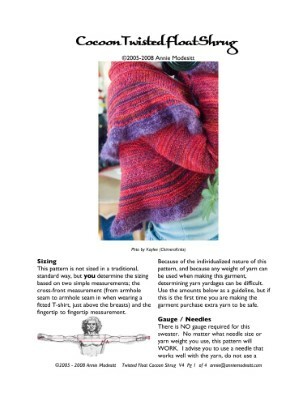 Unlike the original pattern in Fall 2005 Vogue Knitting, this pattern allows you to use ANY yarn you want, and make ANY size you want!